In merger and acquisition activity this week, robodvisor startup Vaamo has been acquired by Moneyfarm, reports Antony Peyton of Fintech Futures (Finovate’s sister publication). Vaamo founder Dr. Thomas Bloch and Dr. Oliver Vins join the executive committee of Moneyfarm. Dr. Bloch will be responsible for the Germany business and Moneyfarm’s Europe-wide B2B business. Dr. Vins will be responsible for product management and development at Moneyfarm groups in the future. There were no details about any job cuts due to the acquisition. Moneyfarm was founded in 2011 and had around 30,000 private clients (double year-on-year) at the end of 2017, with a total investment of ($511 million) £400 million, as reported in May 2018. It has made some good progress as back in May it got($51 million) £40 million in a Series B funding round – meaning it has secured close to ($77 million) £60 million in capital so far. The acquisition is subject to the approval of the Federal Financial Supervisory Authority. Vaamo was founded in 2013. Customers include German challenger bank N26 and 1822direkt. The company launched its goal saving app at FinovateEurope 2014 in London. The company has raised $3.8 million in two rounds from Route 66 Ventures. vaamo receives license for portfolio management by German supervisory authority BaFin. Morningstar’s HelloWallet launches free student-loan calculator. Signifyd and ThreatMetrix team up to combine machine learning and digital IDs to reduce ecommerce fraud. Cartera Commerce launches Offerlink, a free Google Chrome web-browser extension to help online shoppers save money. Kalypton wins the Dassault Systemes 3DS fintech challenge. ACI Worldwide named “frontrunner service provider” for EBA instant credit-transfer scheme. Overbond integrates DBRS credit ratings into its platform. DarcMatter earns first-place honors at Next Money Shanghai Semifinal Pitch competition. Robo-adviser solutions-provider vaamo teamed up with one of the hottest fintech players in Germany today, neobank N26 (formerly Number26). N26 is using vaamo’s API to offer clients N26 Invest, a co-branded solution that lets users select from three investment strategies depending on their risk tolerance. After developing its robo-adviser platform for private investors in Germany, vaamo is seeking to bolster its B2B business model. The company will power an online, automated investment solution for N26. This is the first third-party partner vaamo has signed for its B2B solutions, which can be co-branded or fully white-labeled and are available as a financial intermediary or discretionary portfolio-management solution. vaamo launched its goal saving app at FinovateEurope 2014 in London. The company has raised $3.8 million in two rounds from Route 66 Ventures. mBank partners with PayU to bring mTransfer Mobile to Poland. WS Integration awarded Little British Battler status by Techmarketview. BizEquity named one of the ‘Best Entrepreneurial Companies in America’ by Entrepreneur magazine’s Entrepreneur 360 Awards. Bluepoint Solutions partners with Gro Solutions for mobile account opening. Germany-based vaamo now enables customers to open accounts online. Irish Mirror features Revolut among 8 startups “you need to know about” at the Web Summit in Dublin. PYMNTS interviews Ripple CTO Stefan Thomas. Forbes takes a look at how Dwolla is bringing real-time payment technology to CME Group. BNY Mellon’s Leda Glyptis lists Heckyl Technologies among her personal favorite startups. Small Business Computing features Flint Mobile in its short list of small business financial apps. MasterCard announces launch of MasterPass in Taiwan. Segmint raises $9 million in new funding. Vaamo raises $3.2 Million, Launches Out of Private Beta. Coinbase adds multi-signature tech to its Vault for high net worth Bitcoin holders. Vogogo partners with Knox Payments to enable its future US clients to accept payment from any US bank account. Dataconomy interviews Forte CEO, Jeff Thorness. Google Cloud Platform announces Beta For Local SSD. A German platform where users save and invest money towards their long term goals has brought on some funding of its own this week. Vaamo announced yesterday it closed a $3.2 million (€2.5 million) Seed round. The investment was led by Route 66 Ventures, the same firm that furnished U.S.-based D3 Banking with $7 million last week. The remaining funds have come from business angels. This round comes a year after its angel round of $635,000 (€500,000), which brings vaamo’s total funding to $3.8 million (€3 million). According to vaamo co-founders Thomas Bloch, and Oliver Vins, the funding will be used to hire more talent, specifically for marketing, customer service, and engineering. It will also be used to bolster marketing efforts to improve customer acquisition. Vaamo is opening to the public today after spending about four months in private beta. It currently has 250 customers saving real money on its goals-based platform. It is limited to German residents only, but vaamo has not excluded the possibility of expanding its usage across borders. To learn more about vaamo, check out its live demo at FinovateEurope 2014. We caught up with vaamo today, which just launched its platform on an invite-only basis. Today, 150 users are given access to invest real money into the funds on vaamo’s platform in order to achieve their goals. Vaamo is rolling out the invitations in batches over the next three months or so to accommodate the 2,000 users who have requested full access to its goal-savings platform. 1) Users set up any number of goals on the vaamo platform. These are generally larger life-goals such as higher education, purchasing a house, or saving for a wedding. In the screenshot below, the user has set up and is tracking three separate goals. 2) Using an investment approach it developed in collaboration with the Goethe-University in Frankfurt, vaamo invests the user’s savings into a set of funds. The startup has partnered with Dimensional Fund Advisors to provide a group of well-diversified funds through which users can invest to reach their goals. Dimensional Fund Advisors has offices all over the world, and is headquartered in Austin. 3) If one of the funds changes course, vaamo prompts the user to change their goals using the slider tools on its platform. For example, if a fund lost a significant amount of value, vaamo would prompt the user either to extend the time period of their goal or change the amount desired to reach their goal. Users in Germany can now sign up for a demo account, and will be invited to use vaamo with real money in the near future. In other geographical locations, users can sign up for a demo account, but cannot invest funds in the platform. 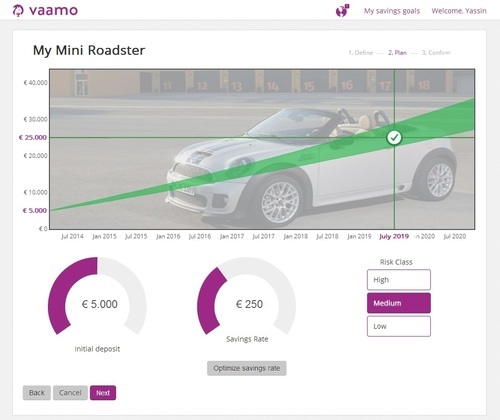 To learn more about vaamo, check out its launch at FinovateEurope 2014.